100% Made Of Natural Baltic Amber. 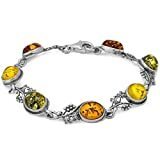 Genuine natural Baltic amber bracelet is made using only authentic materials. Each bracelet is produced with precision keeping the highest possible quality. 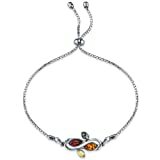 Amber bracelet is extremely light and very comfortable to wear. It looks very dainty and subtle giving a really luxurious impression. Amber bracelet comes in a little gift box. It could be a perfect gift choice for Mother’s Day, Birthday, Valentine’s Day, Anniversary, Christmas or any other occasion. This bracelet is a perfect match for formal occasions or everyday wear. 100% GUARANTEE that we use only genuine Baltic amber. It’s not pressed or modified in any other way. Baltic amber bracelet doesn’t require a special care. Please avoid contacting it with extremely hot surfaces. If the silver gets tarnished gently rub it with a cloth. Fast Amazon prime delivery. 30 days return policy guaranteed. Genuine Baltic Amber. Amber is organic material with healing properties. Comfortable to wear. May are best gift idea. 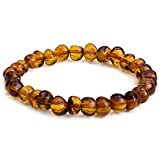 Natural Baltic Amber Bracelet Light Cognac Colour 10,6g 10± mm Size. 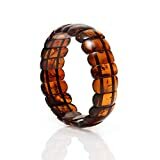 This is natural amber bracelet made from round cut beads. IS IT REAL AMBER? Our Baltic Amber are certified by an independent gemologist as 100% Authentic Amber. 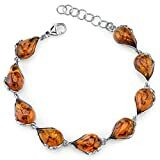 This is amber bracelet made only from natural baltic amber without any inclusions. Every bead is hand made and hand polished and stringed on a thread for best comfort and everyday use. If you have any questions feel free to contact! Amber is a natural gemstone, which is formed naturally from ancient trees over many years' time. Healing properties of Baltic Amber were acknowledged many years ago. For this reason Amber was used not only for making jewelry, but also for medical purposes too. Today health benefits of Baltic Amber are explained by high Succinic Acid content found in this natural resin. This acid is associated with health benefits like pain relief, immune system enhancement, anti-inflammation, stress relief and others. Due to so many properties of Succinic Acid, Amber is also believed to be beneficial for health when it is worn close to the skin.